Husband and wife team Niel and Madeleine de Wet booked their spot at the Lost City and had plenty of fun doing it, writes WADE PRETORIUS. The keenly contested Els for Autism Drive to Sun City had another ‘first’ after a hugely successful stop at Royal Johannesburg & Kensington where the championship East Course, now in full flow after its recent revamp, hosted 116 competitors on a beautiful day. It was a far cry from the foul weather at Stellenbosch Golf Club the week before, but more on that later. Before the 11:30am tee off,the team behind the golf day ran another well-supported Game On clinic where 16 children were put througha variety of exercises amid much excitement and laughter. This was quickly followed by the more serious stuff with a place in the final up for grabs. A count-out was required to decide the De Wet combination as the overall winners. Keen golfers, it was a team effort and an exhibition of dove-tailing that helped them to 47 points; a feat not to be scoffed at, considering the host course’s stature as a stern test of one’s game. ‘We are really good as ateam,’ Niel told Compleat Golfer, with Madeleine repeating him word for word when we caught up with the duo shortly after their win. Invited to play at the day, the De Wets saw off their playing partners but never expected the win. ‘We thought we would come up a few shots short. I three-putted the last,’ says Niel. ‘And I missed a short putt on one of the par fives,’ says Madeleine, a competitive 14-handicapper. ‘It was a fun day for sure and we enjoy playing on the same team. We can both be very competitive but it works for us and we motivate each other,’ she added. The motivation must have worked as Niel registered an exceptional score, which will see his handicap drop for the final. They plan on ‘putting in the hours’ before the final. ‘Lost City takes no prisoners and scores can be gruesome out there, so we better work hard and play well,’ said Madeleine, who has signed up for the Gauteng North Open at her home club of Silver Lakes. 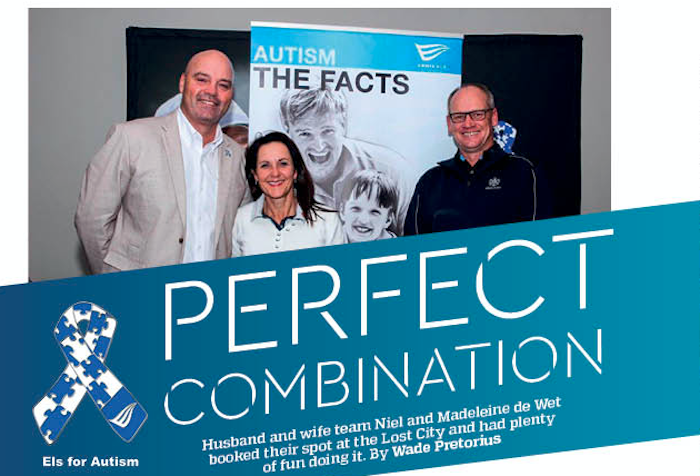 The De Wets, while thrilled to be moving on, took time to praise organiser Nico van Rensburg and his family, all of whom are involved in the work to help make Els for Autism such a success. ‘We are just honoured to play in the days and are ready to sign up for as many as possible. The work Nico does is fantastic but it’s a family affair for him, which is another sign of the dedication,’ said Niel. ‘It’s a phenomenal cause championed by real people, who are giving up so much to impact geniune people in such a positive way,’ added Madeleine. Before Niel and Madeleine’s successful outing, the team at Stellenbosch Golf Club were tested to the limits by torrential rain and strong winds before the fifth leg of the series. Credit must go to director of golf Louis Destroo and his hard-working staff, who were already on the scene when the Els for Autism team arrived at 6am. The weather turned but the field of 144 were none the wiser as the greens were in peak condition. It was at this event that members of #TeamCompleat took their swing at trying to qualify for Lost City but came up miserably short of the mark as Gerhard Kuhn and Marius de Bruin blasted past the field with a massive 51 points. The Stellenbosch leg gave participants the chance to enjoy lunch at the Ernie Els Winery which included a deck chip-off as part of the festivities of another superb day raising funds for a most worthy cause.